This auction is for a 3-Bay Window FIREPLACE INSERT up to 50,000 BTU/Hr., 50lb Hopper Bin, that is MATTE BLACK Door/Window with auto Ignite and burns Wood Pellets and a (Corn Mixture if you wish). The Auction is for the 3-Bay Window MATTE BLACK is being sold, but we showed the GOLD Door version in the listing picture because it is a better-looking picture. We also have this item in Brushed NICKEL Door/Windows or GOLD Door/Windows, and if you want that, then it is $300 MORE. Surround or Flashing is $250 extra in a separate Ebay buy it now transaction and the Medium size has Gold or Nickel trim around the perimeter. If you want the CONTINOUS Bay-Window Option with a 70lb Hopper Bin, then that is extra $300 in a separate Ebay buy it now transaction and the extra increment is paid in an Ebay buy-it-now. You can put it in any size of home, restaurant, any business, office, at 1,500 sq. ft. to 2,000 sq. ft. and even up to 2,500 sq ft subject to the configureration. It's bay-window view makes it a perfect center piece for an evening diner restaurant. Featured in either its NICKEL or GOLD Plated Door/Windows, it is probably the most elegant beautiful bay-window wood pellet stove made. It can range from 8,000 to 50,000 BTU/HR and will heat almost any size space you have. The Continuous Bay-Window Option is a unit that is wider 29-1/8 inches and has a 70lb Hopper and is available for $300 more with the incremental add-on in a special Ebay buy-it-now. A simulated ceramic LOG SET is available as an option. It has Auto-lite, digital contol panel, and thermostat control capability either wall or remote, and a POWER-OUTAGE Module. It is Mobile Home Approved. NOTE: For another $250 we have a Corn-burning model available. The manufacturer's recommended retail selling price of MRSP is $3250 for Black and $3550 for GOLD or NICKEL. Call us at 319-298-0500 for a Buy It Now price that can be arranged through Ebay. Hearth Products couldn't have done any better, the best made stove or insert made in America. This auction is for the 3-BAY WINDOW FIREPLACE INSERT 50,000 BTU/Hr., 50lb Hopper Bin, that has a MATTE BLACK Door and Windows with a Gold Bead around the door. Gold or Brushed Nickel Door/Windows are available for another $300 More. Surround or Flashing is $250 more and the Medium size has Gold or Nickel Trim around the outside. You can get a CONTINUOUS BAY-WINDOW fireplace Insert for $300 more. All OPTION Add-on increments are paid in a separate Ebay buy-it-now transaction. This is done to avoid the circomvention of Ebay fees. All OPTIONS AVAILABLE are repeated here: (1) Flat MATTE Black Door and Window is sold with this listing, (2) either NICKEL Door/Windows or GOLD Door/Windows are $300 MORE, (3) Surround or Flashing $250 more, (4) Bigger Continous Bay-Window with 70lb Hopper 50,000 BTU/HR $300 more, (5) Freestanding Stove $100 less, (6) Corn-burning Model Option $250 more, (7) Wall Thermostat $72, (8) Remote Control Thermostat $295, (9) Simulated Log Set $150, (10) Brick Wall Panel $145, (11) Chimney Flue Exhaust Kit (25') $565, (12) Fresh Air Kit $145, (13) POWER-OUTAGE Module $179, (14) FANS Air Circulators Doorway and/or Room to Room $40 - $65. Again to repeat: all these Add-on OPTIONS are paid by creating a special Ebay buy-it-now transaction for the add-on components only. You must have AUTO-Ignite to use this feature. It is possible to either run this Fireplace Insert with either a Thermostat or without one. The switch at the top of the digital display has either AUTO Mode, HIGH/LOW Mode, or Manual Mode. In AUTO Mode, the thermostat will turn the insert(stove) on by electric igniter. In HIGH/LOW Mode, the thermostat will set from the factory low setting to your desired Heat Select setting. If you run in thermostatic mode, it is recommended you run in HIGH/LOW Mode. The thermostat hooks up to two terminals in the rear of the printed circut board. We sell either a Wall Digital (Round or Square), or a Wall Dial-Indicator Thermostat, or a Remote Thermostat. A Power-Outage Module is available at $179 to supply 115 VAC to your crucial electrical devices ... a smart item to have as backup in power outages. Use this module for POWER OUTAGES and you can run it from any 12 VOLT BATTERY either a Car battery or a Deep Cycle Battery. It supplies 1000 WATTS of 115 VAC POWER with two outlets and battery cables are supplied. It will will run a variety of devices such as a CORN STOVES, WOOD PELLET STOVES , furnaces, appliances, lights, sump pumps. It even has a USB Type A outlet that will enable it to charge IPOD's, Blackberrys, and Cell Phones. SIZE: 10 inches Wide, 5 inches High, 15 inches Long, WEIGHT: 15 lbs. Below we are listing the fireplace insert dimensions for Front (in front of fireplace), Rear (sticks into fireplace hole, Hole Opening recommended, Space clearance recomended, Surround Dimensions. REAR (Sticks into fireplace hole): Width 29-1/2" tapers back to 22", Height 21", Depth 16-3/8"
HOLE OPENING Recommended: 36" Front Width tapering to Rear Width 24". Height recommended 21", Depth recommended 17". Large Surround is 48-1/2" W x 32" H.
REAR (Sticks into fireplace hole): Width 28-1/2" tapers back to 22", Height 19-1/2", Depth 16-3/8"
CLEARANCES Recommended: Inside-Wall Spacing Sides 3" and Rear 3", Top Inside hole Ceiling Spacing 4-1/2", Hearth Pad Height 8", Front floor in front of insert 6", clearance to top of Mantle 14"
Large Surround is 49-1/2" W x 32" H.
The demand for wood pellet inserts (stoves) has gone up as people are switching to wood pellets because of Corn price increases ($6.75 to $9.95 per 50 lb bag) due to Ethanol demand. The price of wood pellets at $4.50 per 40 lb bag is expected to increase this winter to $5.50 per 40 lb bag ... but it is still less than corn. The costs to operate a stove will be 1/3th to 1/4th natural gas, propane gas, and fuel oil.. $5.50 per Bag will heat a 1500 square foot home one day or and average of $165.00 per month. That beats a $500.00/month Natural Gas bill by a long shot! 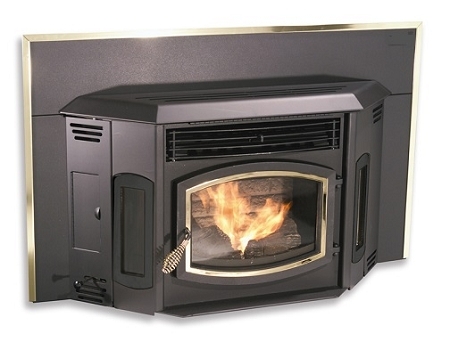 FIREPLACE INSERT: Air-Filter King Fireplace Insert w. Surround, 50,000 BTU/Hr., Cleans Room Air with Dual-Bay Filters, Wood Plellet Insert with a Corn-Burning or Mult-fuel Option Add-on, up to 2000 Sq.Ft. 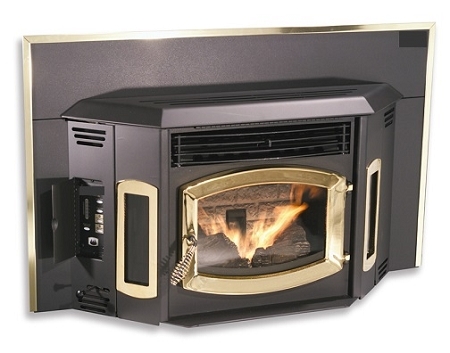 FIREPLACE INSERT: Econo Saver Fireplace Insert, 40 to 50,00 BTU/Hr. subject to type of fuel burning e.g. wood pellets or Corn, etc., Corn and Multi-fuel Burning Option Add-on, up to 2000 Sq.Ft. There is a LIMITED LIFETIME WARRANTY such as 5 YEARS on the heat exchanger, combustion chamber, the fire box, door, any structural steel, etc., 1 YEAR Warranty on Glass, and 1 YEAR Warranty on electronics. Be careful from whom you buy. We are a Dealer specializing in wood pellet and corn stoves and can help you through your installation as well as and trouble shooting if necessary down the road. Be careful as others do not have the capability to do that. This Pellet Stove (Furnace) just arrived and we have only one. Customer may pick this item up in person or have it shipped by a commercial freight carrier 450 lbs to the nearest large-city Main Terminal serving the customer's geographic area and the Customer will pickup the item at this Main Terminal. MATTE BLACK Door is being sold in this auction. Auto-Ignitor self-ignite, Heat Output ranges from 8,000 to 50,000 BTU/HR, Heating Capacity ranging from 1,500 to 2,000 Square Feet with up to 2,500 Sq Ft on special configurations, Fuel Hopper Capacity 70 lbs. The EPA Particle Emission rate was tested at 2.19 grams per hour. Weight of stove 325 lbs, weight of shipping with crate/pallet 450 lbs, Dimensions:Width 29-1/2" fireplace opening tapering back to 22" Height 21 inches, Depth 16-3/8 inches, Thermostatic Control OPTION available , Gold, Nickel, Black DOOR OPTIONS available , Bigger Continuous Bay-Window available, Electrical 110 VAC, 4 Amps, 60 Cycles, Safety Tested and Listed: ASTM E 1509-95 Room Heaters, UL 1482-1998 Pellet Fuel Burning, Mobile Home Approved 814-23-900 through 814-23-909. The Unit was independently tested by EESPC, Kent, WA or Warnock-Hersey, Vancouver, B.C., as you can see it is Candian Approved CSA and ULC, Manufacturer: Hearth Products of America.